Home / Amazing / Technology / Video / This guy drops a 24K gold iPhone 6 inside a lava lamp. While doing a test, something happened. This guy drops a 24K gold iPhone 6 inside a lava lamp. While doing a test, something happened. 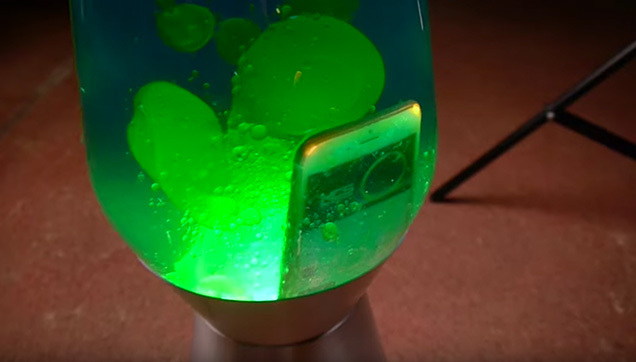 Have you ever wondered what will happen to your iPhone if you drop it inside a lava lamp? Well, wonder no more because these guys are about to show you. The 24K gold iPhone 6 inside the huge lava lamp. A Ukraine-based YouTube channel called TechRax, which describes itself to be a channel "smashing technology since 2011", made an experiment with a 24K gold iPhone 6 and a lava lamp. A lava lamp is a novelty decorative item that contains blobs of colored wax inside a glass vessel filled with clear or translucent liquid; the wax rises and falls as its density changes due to heating from an incandescent light bulb underneath the vessel. In the video below, he opens up the top of the lamp by smashing it with a hammer to create a hole big enough for the iPhone to fit in. He then proceeded showing that the iPhone was a working one, even playing a song on YouTube before dropping it inside. The iPhone worked for a while, and the song continued playing. But as the wax inside started clinging to it, the iPhone’s screen turned black but the flash seemed to be abnormally working still as it started flashing. However, before the guy could pour the contents out, he heard a light popping sound somewhere and warned the audience that it was not safe to try it at home. Watch the video and see for yourself the experiment this guy did!